UFO in the mountain areas? No! 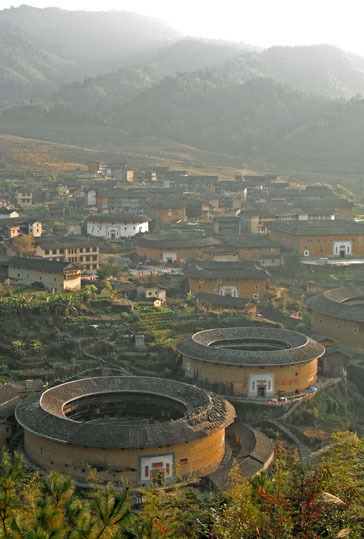 It's the Fujian Tulou - local earthen rammed houses built by the Hakka people in Fujian Province, Southeastern China. This unique building style has been inscribed as World Cultural Heritage by UNESCO in 2008 as "exceptional examples of a building tradition and function exemplifying a particular type of common living and defensive organization [in a] harmonious relationship with their environment". Mostly built in the 12th-20th Century, tulous are both accommodation buildings and defensive construction, usually circular or rectangular in shape. Since the very beginning, tulous are functioned as village unites offering shelter, safety and a sense of community. Most tulous are dwelt by a single large clan of several generations, like a small kingdom of a clan. The largest tulou can hold up to 80 families, nearly 800 people in total. 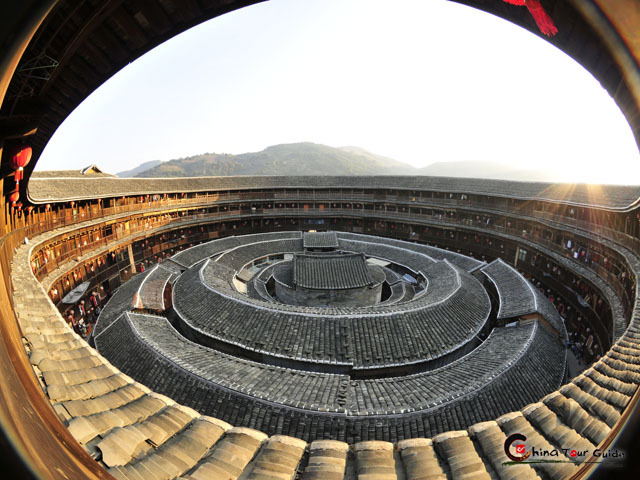 The Fujian Tulou is chiefly found in three counties - Yongding, Nanjing and Hua'an, of which Yongding Tulou is the most famous. 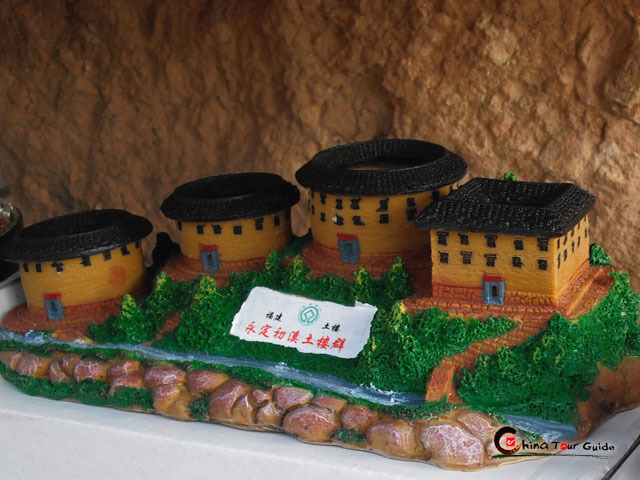 Major earthen buildings of Yongding County include Chuxi Tulou Cluster (incl. Jiqing Lou), Chengqi Lou (King of Fujian Tulou), Zhencheng Lou (Prince of Fujian Tulou) and Nanxi Tulou Cluster (incl. Zhenfu Lou & Yanxiang Lou). 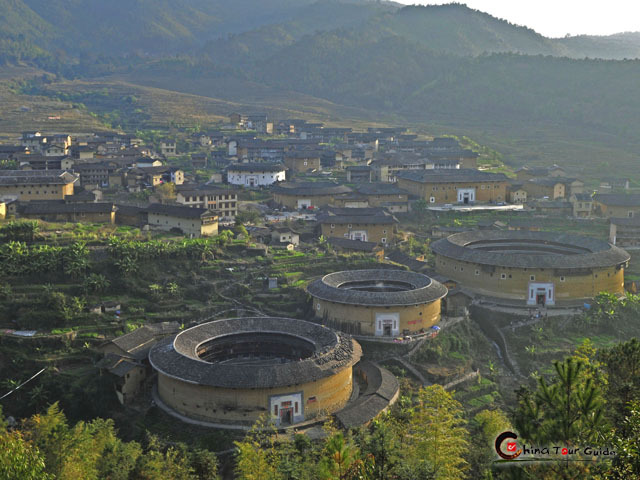 Fujian Tulou meets the needs of housing the whole clan members, defensive requirements, guarding against wind, earthquake, fire and damp, as well as ventilation, lighting keeping warm in winter and cool in summer, education and so on. 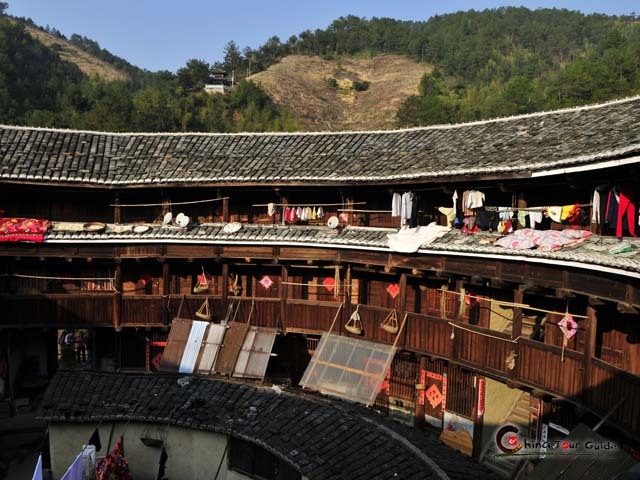 A Tulou is just like a small society. In structure, the main building of a Fujian Tulou is made up of a rammed earthen wall as the outer part and wooden framwork inside. The fortified outer structures are formed by rammed earth mixed with stone, bamboo, wood and other readily available materials, to form walls up to 1.8m (6ft) thick. 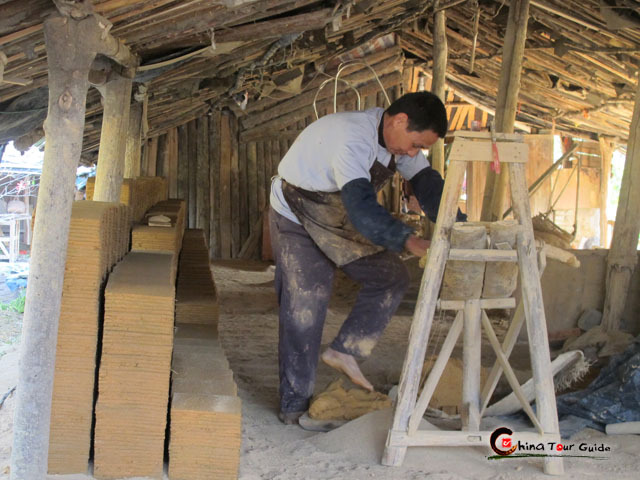 Branches, strips of wood and bamboo chips are often laid in the wall as additional reinforcement. 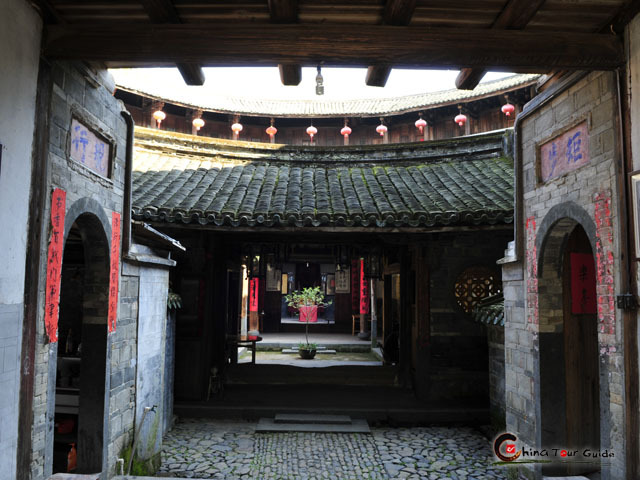 In layout, Fujian Tulou followed the Chinese dwelling tradition of "closed outside, open inside" concept: an enclosure wall with living quarters around the peripheral and a common courtyard at the center. Traditional Chinese concepts of Feng Shui like Bagua (The Eight Diagrams)are also adopted in building Tulous. 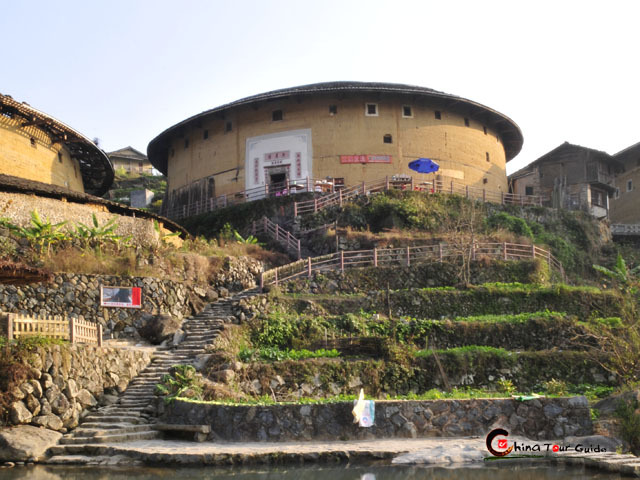 A Tulou is usually 3-5 storied structure with a thick earthen wall and only one entrance. The first floor is used as kitchens, the second floor storehouses, and above the third floor are living quarters. 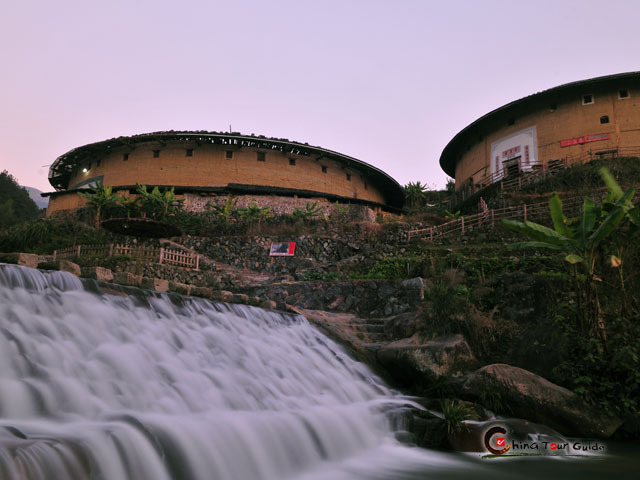 In the center of the tulou is the ancestral hall, where major activities like worshipping, festivals, meetings, weddings, funerals and other ceremonies are held. The bottom two storeys are solid with no window nor gun hole; windows are open only from the third above storeys. Circular corridors (with railings) from the second to the uppermost floors were made of wood boards laid on horizontal wooden beams with one end inserted into the earth wall. Staircases are distributed evenly around the corridors, four sets being the usual number. 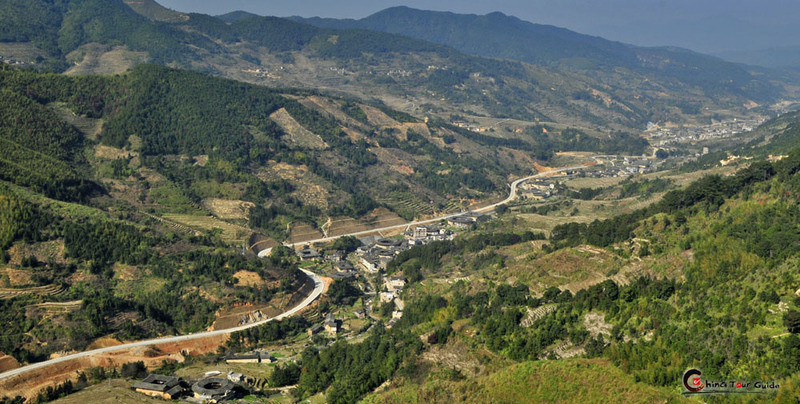 (Jiqing Lou of Chuxi Tulou Cluster is an exceptional one with 72 staircases.) Public water wells are usually located at the center courtyard. 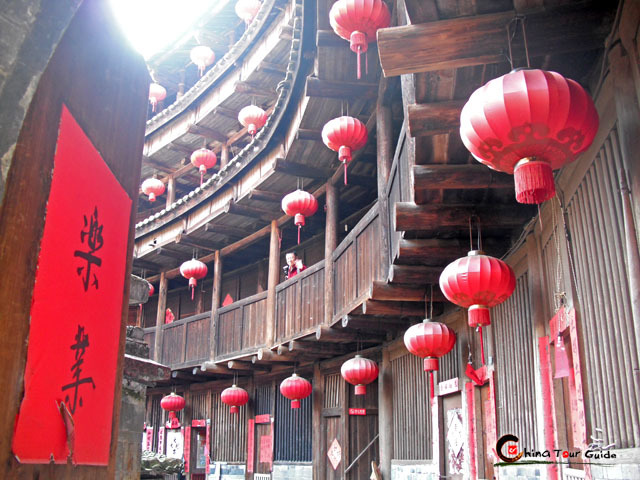 The Fujian Tulou (Hakka Houses) is chiefly found in three counties - Yongding, Nanjing and Hua'an. 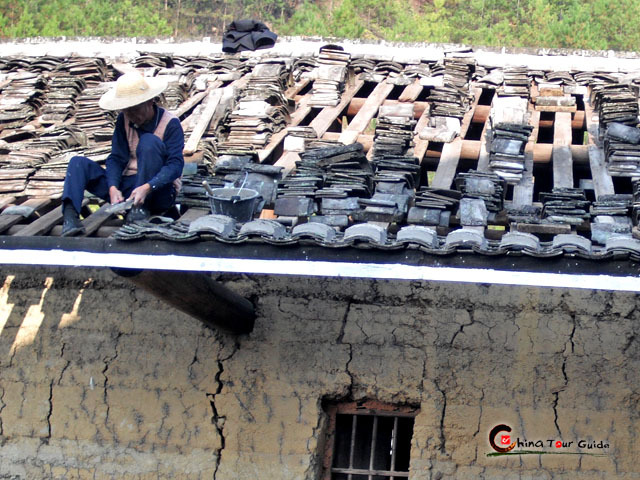 Yongding alone includes more than 20,000 Tulou buildings of various sizes. They gather in clusters and stretch along the mountain place in several kilometers length, just like a "Great Wall" of Fujian Tulou buildings. 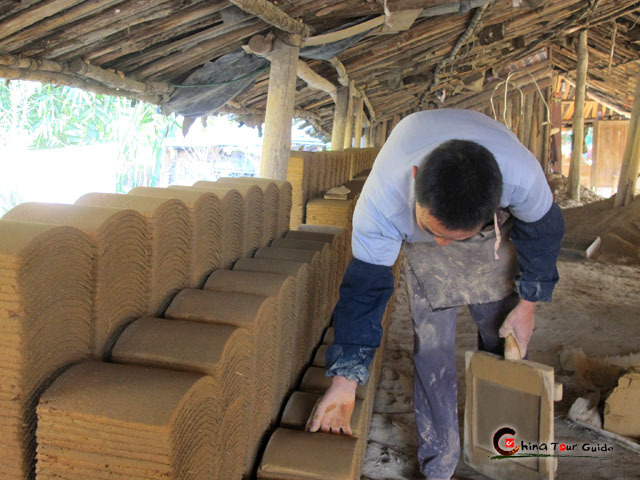 The over-400-year's history of tobacco trading is one driving force for Yongding Tulou's building in large scale. 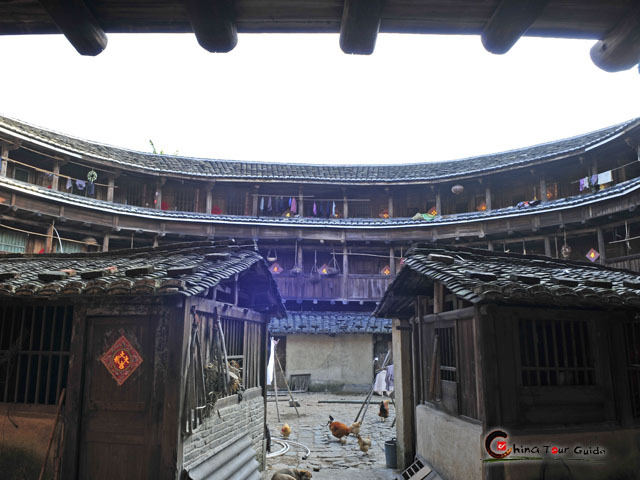 There are three main categories (circular, rectangular, five-phoenix buildings) of tulous in Yongding County, of which the circular ones are considered the most attractive. These circular tulous in their design adopt the traditional concept of Bagua (The Eight Diagrams) of Feng Shui, a common feature of the design of military defense in ancient China. 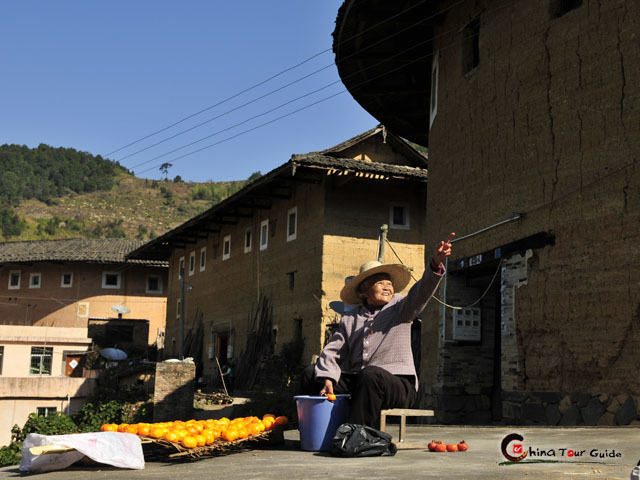 Chuxi Tulou Cluster, one of the major groups of Yongding Tulou, is a less trodden place and therefore preserves the original appearance and lifestyle at best. It's made up of 5 circular tulous and tens of rectangular ones. Among them, Jiqing Lou, dating back to 1419, is the oldest and biggest of the region, and has 72 staircases. It can hold 72 families at a time. Zhencheng Lou (Prince of Tulou), belongs to Hongkeng Tulou Cluster. It's a double ring tulou. The outer ring 4-storied high and has 187 rooms, while the inner one is 2-storied with 32 rooms. Chengqi Lou King of Tulou, belongs to Gaobei Tulou Cluster. 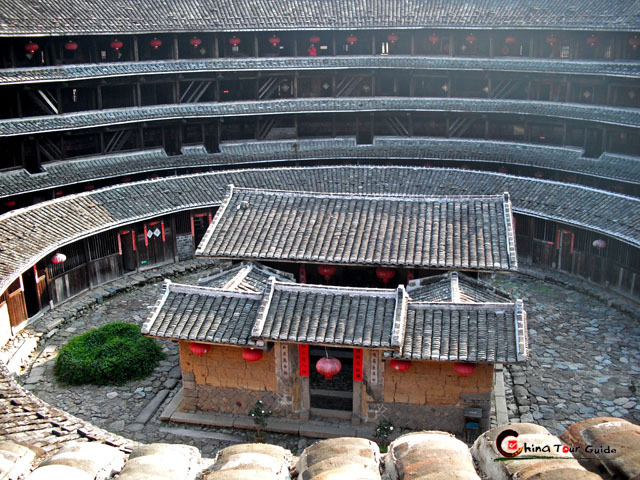 It's massive round tulou with 4 concentric rings surrounding an ancestral hall at the center. At its heyday, there were more than 80 family branches lived here. 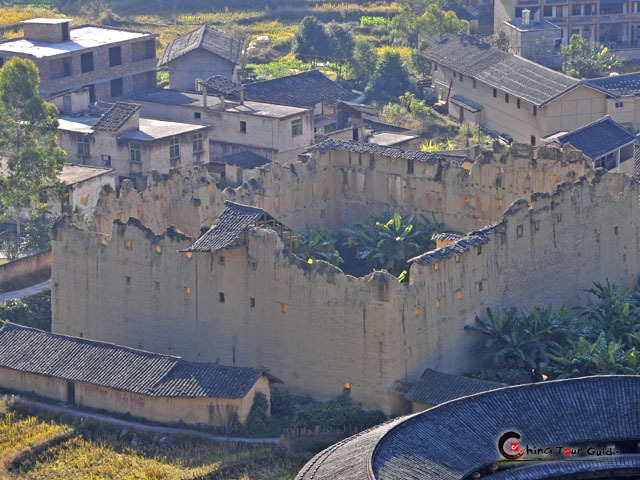 Nanxi Tulou Cluster gathers in large cluster and is referred to as the "Tulou Great Wall" due to its astonishing visual effect. 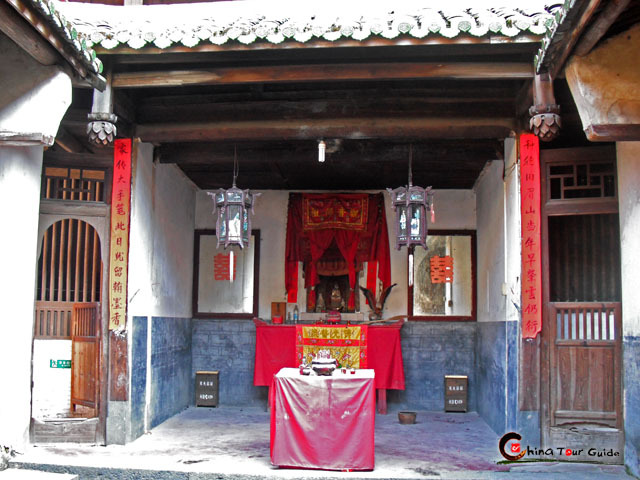 Yanxiang Lou is one of the famous tulous and part of the World Heritage Site. 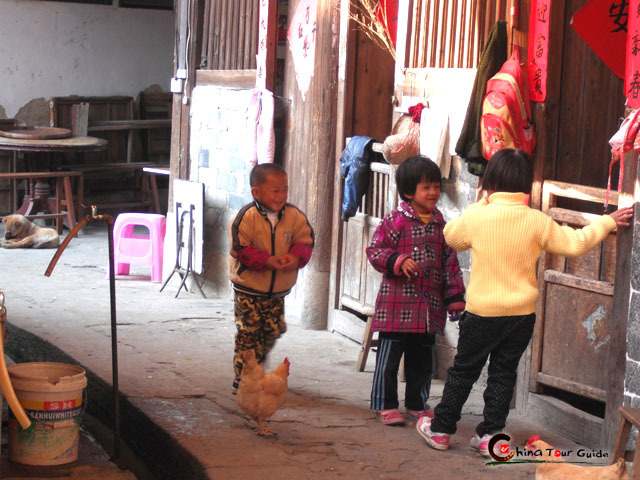 A tulou is usually dwelt by a large family clan of serveral generations. 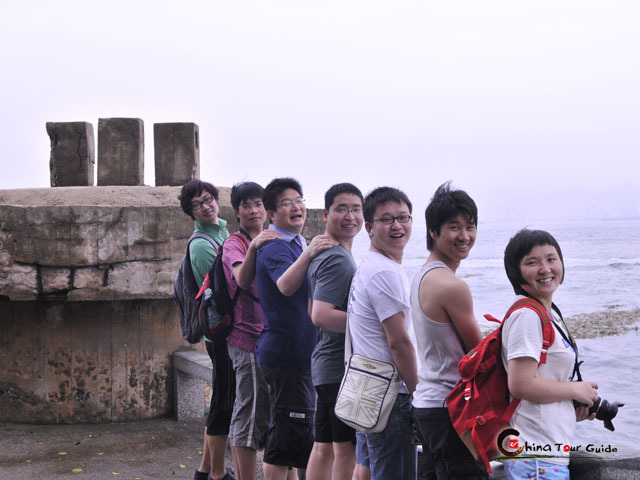 In Chinese tradition, a family is growing with each male counted as a branch. Even from the structure it can be seen that unlike other housing types around the world with architecture reflecting social hierarchy, Fujian Tulou displays its unique characteristic as a model of community housing for equals. All rooms are in the same size, with the same grade of material, same style and same decoration. Usually a small family would take up a vertical set from the 1st floor to the highest, while a larger family would own two or three vertical sets. Please click " " to add the attraction in you favorite list, let us plan a private Fujian Tour for you.